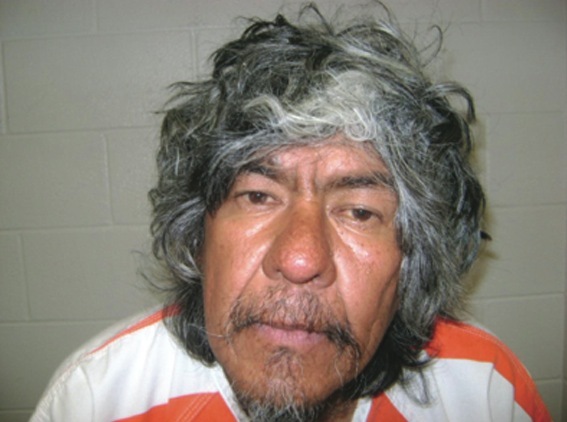 UMATILLA COUNTY, ORE. – Cellmates of inmate Pete Villarreal in Oregon’s Umatilla County Jail likely don’t know they’re in the presence of a legend. The charges of Disorderly Conduct and Trespassing belie the stature of the meek fellow cooling his heels in the stir. Arcata’s well-known street wanderer, taken off the streets in a 2008 intervention by his family, is in protective detention. Pete’s content, say relatives, if a little thirsty. Alma said Pete made a go of living at home with his family for a time, but eventually returned to his old ways of wandering the streets, consuming excessive amounts of his favorite beverage and placing himself in dire straits. Alma said Hermiston Police grew tired of arresting and re-arresting him for the same things over and over. So for now, he’s being kept where he can get three squares and a warm bed. Perhaps it’s the time of year, but recent callers and visitors to the Arcata Eye have wondered about the whereabouts and well-being of the beloved Ragman. And he hasn’t forgotten about them, either. 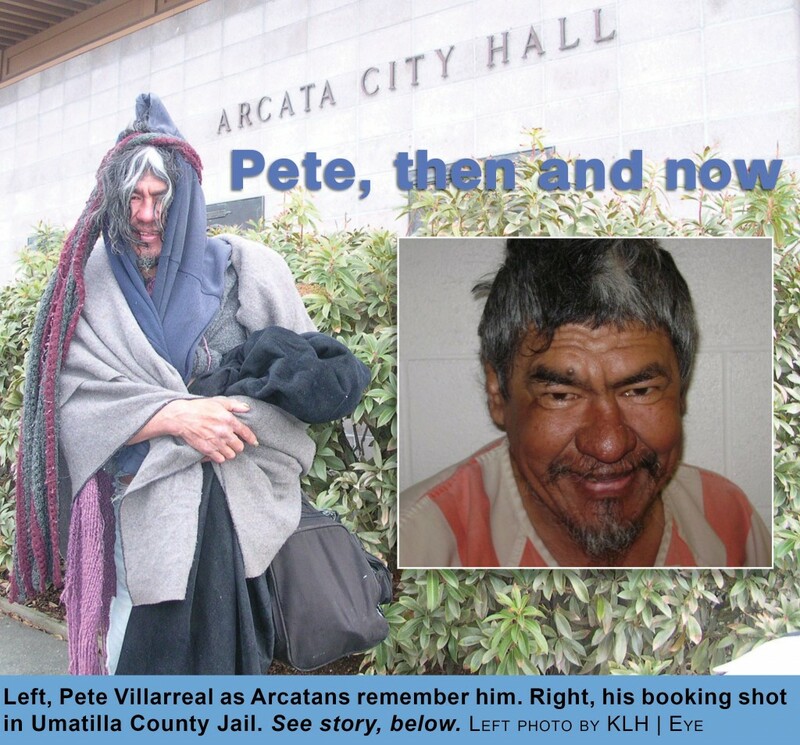 Clean and sober in jail, Pete has had time to reminisce about his many friends in Arcata, where his town-wide fan club remains strong. Note: the following story was published in the Arcata Eye November 18, 2009. – Ed. UMATILLA COUNTY, ORE. – Pete Villarreal, who left Arcata for Oregon following an intervention by his family, is back to his old ways. Pete, known as “The Ragman,” was a frequent sight on Arcata’s streets until the January, 2008 move. Years of outdoor life with friends of convenience and a fondness for bubbly beverages led to close brushes with exposure, compelling relatives to take him in at the family home in Hermiston, Ore.
For a time, the family was able to keep him close at home, working to restore his health and mental clarity. But Pete is still Pete, and his restless soul could not be contained. Within months he was back on the streets, and the bottle, again. On July 4, Pete was jailed for a number of serious-sounding violations – trespass, disorderly conduct, burglary – that really come down to his never-ending quest for beer. He’d been banned from an area liquor store, but couldn’t stay away. “He’s a little confused and forgetful,” said his sister, Alma. She said Pete had neglected to list individuals who he’d allow to visit him in jail, then wondered why no one had come to see him. A court-ordered mental evaluation is being done. Meanwhile Alma and the family are just glad that, given his high-risk behavior, Pete’s in protective custody. At 52, Pete’s disregard for his health and a disturbing tendency to wander in traffic make incarceration the most attractive option for now. In jail, he’s off the sauce, though that’s not his only deprivation. “He misses candy,” Alma said. Alma said jail personnel have become fond of Pete, phoning the family with updates on his well-being. “He just makes everybody love him,” Alma said. Note: the following story was published in the Arcata Eye Jan. 29, 2008. – Ed. ARCATA – The streets, back alleys, police cars and ambulance gurneys of Arcata are going to be missing a frequent occupant from now on, because Pete Villarreal has moved to Oregon. With his health noticeably deteriorating in recent months, Pete’s family has taken him into their care in their home in the town of Hermiston. The intervention was engineered by artist Alan Sanborn, a Northtown resident who has helped Pete manage his affairs over the years and provided him shelter at times. Alarmed at his decline, Sanborn worked with Arcata Police and Public Guardian Kelly Schwartz to reconnect Pete with his family. After recent close brushes with tragedy – he’d been rumored dead, and last week was found after a particularly frigid night with a body temperature of 85 degrees – Sanborn knew it was time to act or lose the familiar figure on Arcata’s street scene. Since none of the motels would rent him a room, Sanborn provided Pete lodging in his garage a week ago Sunday. On taking him over to Hutchin’s Market to buy him some dinner, Pete selected a 12-pack of beer, a bag of barbecue potato chips and a bottle of hot sauce. But even with food and shelter, Pete was in a bad way. With cracked ribs, Pete couldn’t sleep laying down. He never fully recovered from his recent hip injury, had shoulder problems, swollen feet and failing vision. Unlike many who ply the streets, Pete had style, and enduringly so. Bundled in his familiar blankets, Pete unfailingly sported a fanciful peaked-pyramid headdress of sorts, even in the most troubling circumstances. Friends who offered him fresh garments noticed them fashionably tattered within minutes. “Pete’s an odd case; a free floater,” Sanborn said. That outward image as a blithe spirit masked a keen intelligence. Sanborn said that up until six months ago, Pete always knew precisely how much money he owed him. Last week, as he spoke on the phone to his family in Spanish from Sanborn’s home, Pete seamlessly switched to English when he wanted his host in on the conversation. Alma is providing Pete with three squares a day, alcohol absent. She and her brother Juan shed some light on Pete’s hitherto unknown early life. Born in Auburn, California on Oct. 15, 1956, young Pete moved to Mexico when his parents split up. There, he was raised by his grandmother until moving back to La Habra as a teenager. Even then, Pete’s footloose spirit led to disappearances. Juan said young Pete gravitated toward agriculture, gaining skills that served him well later in Arcata. He helped with construction as a welder’s assistant, and in potato plant distribution. Pete also mowed lawns at a golf course. He had his idols too. One was martial arts star Bruce Lee, from whom Pete gained a fascination for Kung Fu. “He was the number one Bruce Lee fan,” Juan said. “He would get in front of a mirror and do all this stuff and be just like Bruce Lee.” Another contact sport, boxing, was a related interest. Eventually, Pete moved to Hermiston, Ore. with his siblings. There, he met a girl and became smitten. When she moved to Arcata sometime in the mid-1980s, he followed suit. One version is that she said, “I love you” in a parking lot, and Pete’s Arcata destiny was cast. Legend has it that heartbreak ensued, with subsequent years of alcoholism and self-inflicted hardship a form of penance. While some know Pete Villarreal by nicknames such as “the Ragman” and the disrespectful and inaccurate “Incomplete Pete,” locals familiar with him use terms like “icon,” “legend” and “fixture” to describe the tatterdemalion traveler. While they regret that they’ll no longer see him traipsing around town, Pete fans are relieved that he’s in the care of responsible relatives rather than the grotty-dubious personages with whom he frequently hung. “It’s sad to see a familiar face in Arcata leave this community, but I’m glad that he’ll be cared for by his family” said Mayor Mark Wheetley. He, like others, had noticed Pete’s deterioration in recent months. Groves’ veneration of the Ragman was limned with appreciation for his humanity. “He is a legend, but he’s also a person and a nice guy,” she said. Police Chief Randy Mendosa lauded Sanborn’s and Schwartz’s actions to improve Pete’s situation. 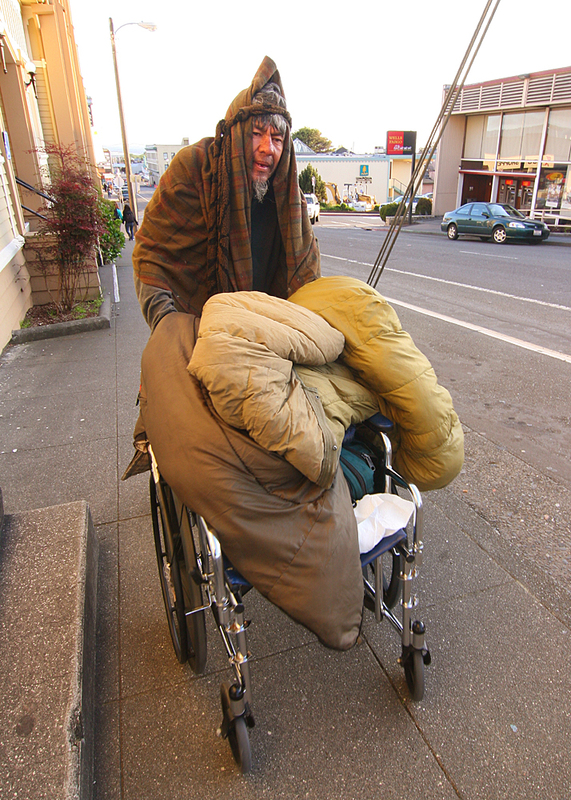 “I’m relieved that he’s not out freezing on the streets any more,” Mendosa said. “He’s an icon – a part of Arcata, even though he was Arcata’s ‘Million Dollar Murray.’” That refers tothe Reno street person written about in the New Yorker, whose condition – and the inability of authorities to provide a permanent solution – was a cumulative, costly drain on public safety and other services. The chief said it was hard on his officers to continually extract the Ragman from increasingly dire circumstances. “It was very upsetting,” Mendosa said. Others were bitter at the loss of a quality-of-life factor. Pete’s persistently flirtatious ways didn’t endear him to all the ladies. Sanborn recalls a heated argument in his yard between Pete and a woman not charmed by sexual harassment. The advances rendered Pete persona non grata at Toby & Jack’s. Despite his behavioral excesses, bartender Donna Hammers had watched with anxiety Pete’s recent decline. A few weeks ago on Seventh Street, she said, “I came across him tipped over on his back, and all I could see was feet. I pulled over and said, ‘Pete, are you alive?’” When the rigor mortised-looking Ragman didn’t answer, she called police, who called an ambulance to take him away for yet another emergency room visit. “It’s going to be a missed visual in the community,” said Dennis Rael. “He’s a piece of Arcata history, and I hope he does well in Oregon,” said Joyce Jonté. She expressed gratitude to fellow artist Alan Sanborn for his role in the intervention. “I’m happy that he has a place to stay and someone to take care of him,” echoed Endeavor Boardmember Roger Herick. “Ever since I was a little girl I saw him walking up and down Alliance Road,” recalled Jenny Bowen. “I’m happy that he has a nice, warm place,” said Julie Vaissade-Elcock. “He’s an institution,” said Gene Joyce. “A sweet and harmless guy.” Joyce recalled a more muscular and powerful Pete in the 1980s, since dissipated to fragility by street life and its associated beverages. Poet Crawdad Nelson, now a Sacramento resident, was pleased to hear of Pete’s upturned fortunes. “I’m glad Pete’s still above ground,” Nelson said. “He is still the only panhandler I ever met that actually gave change, the silly monkey. “I spent a night with him and some other guys listening to him tell a harrowing and surreal kind of story about crossing the Sierra Madre with a mule during a thunderstorm. I think he may have been struck by lightning or something. I can’t remember, but it was quite a story. There’s more to that guy than meets the eye. Pete did seem to possess otherworldy powers at times. This reporter once gave a hitchhiking Pete an unauthorized ride  in the Arcata Union van to the former satellite county courtroom in Valley West in the early 1990s, where he had to deal with one of his camping tickets. Asked where he had spent the night, Pete replied, “Under an apple tree.” On completing a few newspaper deliveries and returning directly to central Arcata, the reporter spotted Pete standing near the Co-op with newfound cohorts, smiling and holding a balloon. Beyond his image and antics, nonsense and nicknames, Pete Villarreal is a beloved brother to Alma and Juan. They intend to nurture and restore him to health, and guide him away from the self-destructive street ways he adopted in Arcata. “We want to help him all together, as a family,” pledged Juan. “The whole family loves him with all our heart,” said Alma. Juan credits Sanborn – whom he refers to in his heavily accented English as “Mr. Alan” – with saving Pete, further affirming Juan’s faith in humanity. Juan said the Arcata community at large had made quite clear its love for his brother during his recent visit. This entry was posted on Friday, November 12th, 2010 at 4:37 am	and is filed under News, Community. You can follow any responses to this entry through the RSS 2.0 feed.